These days, time constraints to maintain long hair have led many females to opt for medium-length hair that gives them a perfect look. Medium hair takes lesser time to wash and can be set with a few strokes of any hair brush. It is mainly apt for working women and school-going young girls who find it difficult to manage long hair. Many others who like to experiment with different hair styles also prefer medium-cuts to get a new look. It is also suitable for people who have thin hair. They get a bounce that makes their hair look heavier and better. People with natural long curls can equally enjoy a medium style. A jagged layer is a popular hairstyle for women because it does not require frequent trimming thereby reducing the need to visit salons frequently. Razor-cut is another option that adds a glam factor to both straight and curly hair. People with straight hair can prefer side-parting to make hair look fluffy. Normal long layers on the sides and a bang at the center is normally liked by people who have straight and thin hair. Medium hairstyles can be tied in a pony tail or with a clutch for the purpose of comfort. They do not require many setting procedures and maintenance products. Another advantage is that both center and side-parting looks apt in medium styles. Highlighting medium styles add some extra detail in the look. It makes the layers look more prominent and defined. Medium hairstyles are also divided into two categories, formal medium hairstyle and casual medium hairstyle. Formal styles are neat, structured, and require styling procedures. They are normally carried for a short span of time i.e. while attending a formal occasion like wedding, awards function, farewell party, etc. The style is kept intact using hair sprays, rollers, clips, pins, and bands. Casual styles are slightly unkempt, free-flowing, and easily manageable. They require a styling time of maximum 10 minutes and need a trimming once in a month to retain the style. The styles can also be carried in semi-formal occasions. 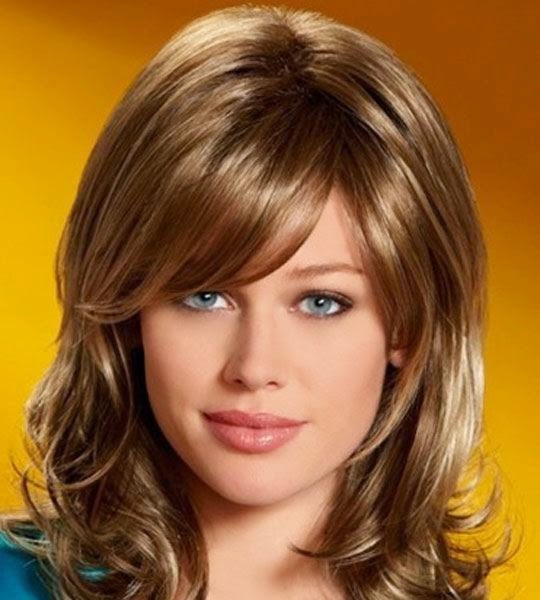 Nowadays, the technology has advanced to such a level that one can create their computer images in different hairstyles to know which style will suit them the best. This reduces the risk involved in experimenting a new look. Moreover, a number of hairstyling websites show variety of latest hair styles and the list of hairdressers for one's convenience and exposure.